In My Sailthru, you can download a CSV file of user data for any list. 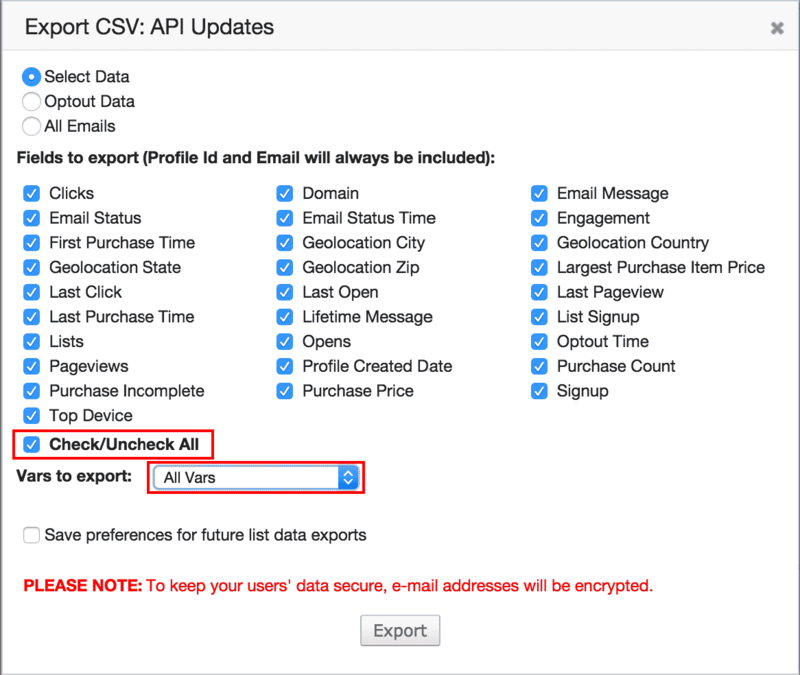 You can select which fields and vars to export, or choose to export only email addresses or opt-out data. To export this data through our API, see the job export_user_data call. If you need to export additional data from Sailthru that is not included in these exports, see Data Exporter. For enhanced security, only Sailthru seats (admins) that have been assigned PII (Personally Identifiable Information) permissions by their administrator are able to download raw email addresses. By default, your list exports will instead contain hashed email addresses. For more information, see Hashed Email Addresses below. In My Sailthru, go to Users > Lists. Locate the list you want to export, and in the rightmost column, click . Select All Emails, and click Export. At the top of My Sailthru, click . Find your job in the table. If it is complete, at the end of its row, click to download the file. Export a CSV file containing the names of all custom vars in use across your userbase. You can choose to export additional details for each var, such as the number of profiles that contain it and sample values. On the Lists page, click the Export User Vars button. Choose to export user var Names only (a very quick process) or Names and usage information (which may take some time if you have a larger user database). A CSV file is downloaded containing the requested data. 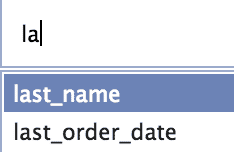 If you chose to include usage information, the following data fields are also included as additional rows. Under Fields to export, select individual fields, or Check/Uncheck All. For information about each field, please see the field glossary. Next to Vars to Export, select Only Specific Vars. In the field below, begin typing a var name. Matching auto-complete results appear below. Use the arrow keys to select one, and press enter, or simply click the result you wish to use. You can alternatively paste in a comma-separated list of var names. If you want to default to these field and var selections the next time you view this screen, check Save preferences for future list data exports. Note that if you only require certain fields or vars in your export, a custom export of only those fields and vars will be generated more quickly. See “Select Specific Fields and Vars to Export” above. Under Fields to export, select Check/Uncheck All. Then, next to Vars to Export, select All Vars. If you want to default to export all fields and vars the next time you view this screen, check Save preferences for future list data exports. Your export will contain only the email addresses or hashes (based on your account permissions) of those users who have opted out of all email, campaigns only, and/or specific templates, along with an optout timestamp for each. Select Opt Outs, and click Export. Downloading hashed email addresses protects you in case of a security breach involving one of your employees. Most of the time, an admin should never need access to raw email addresses; you can segment, report, and create audiences with the data that is given to you in a hashed email list or within the Sailthru interface itself, for example, by using Audience Builder. Because Sailthru uses the industry-standard MD5 hashing algorithm, you can also match hashed email exports with known users in your other systems. The Super Admin of your account can change who has access to raw emails in Permissions > User Management. You can read more about the User Management page here. Click the wrench next to the user’s name. When you download a list, and have PII permissions enabled, you will be prompted to choose the type of data. For unencrypted emails, check the box, “Download unencrypted email addresses and PII.” You must then complete an SMS verification to finish the download process. External IDs (extid) will not be hashed.